07 May 2015 - Get 15% off online tickets by quoting LONDON15 and join us at the London Pet Show this weekend. We will be on Stand DB31, please come and say Hello, we'd love to see you. 03 Jan 2014 - North East walk report added. 14 Nov 2013 - The list grows for health tested Approved Stud Dogs. 22 Oct 2013 - A few December group walks have been added to the Group Walks section in the News & Networking area of the website. Get ready to wrap up warm and remember to take a flask and some mince pies! To see all the group walks that are being planned drop into CCGB chat just here. 09 Sep 2013 - September and October group walk details added here. 31 Jul 2013 - Gemma Harris has been added to the list of Approved Cockapoo Breeders. 22 July 2013 - More group walk reports and some great photos have been added here. 19 Jul 2013 - New webpage What To Expect From An Approved Breeder including feedback form. 19 Jul 2013 - Group 'glamping' holidays are now being organised by Kirsty for April and October 2014 giving you plenty of time to get the dates in your diary. Visit the Group Holidays page in News & Networking section for details. 10 Jul 2013 - July meets are now listed here if you want to come along. 07 Jul 2013 - Team Cockapoo e-shop is launched and selling CCGB Merchandise here. 06 Jul 2013 - Just Dogz have been added to the list of Approved Cockapoo Breeders. 27 May 2013 - Another great cockapoo blog. Follow Ruby and Pepper on their agility and camper van adventures here. 25 May 2013 - We have 7 CCGB meets organised during June. Take a look here to see if there's one near you. 19 May 2013 - Another cockapoo blog, Miss Darcey's Adventures, has been added to the networking page. Blogs are great for potential owners who want to see what it is like living with cockapoos day to day. 08 Apr 2013 - The Approved Breeder status of Tinyshires has been revoked and they are no longer CCGB Approved Breeders. 19 Mar 2013 - Jays Doodles, Tinyshires and Frances Finlayson have been added to the list of Approved Cockapoo Breeders. 17 Mar 2013 - 'POO PARADE for all comers has been added to the 'Games events - details of The Cockapoo Games 2013 here. 04 Mar 2013 - Let The Games Begin - on-line entries now being taken here. 06 Feb 2013 - Let The Games Begin - details of The Cockapoo Games 2013 here. 09 Jan 2013 - The Cockapoo Meets page is starting to take shape and more walks are being planned. 17 Dec 2012 - Keep checking the link here for details of The Cockapoo Games 2013 as they are released. 17 Dec 2012 - The December edition of the 'Poos News has been added to the Newletters page. 06 Dec 2012 - Sharon & Paul Collins have been added to the list of Approved Cockapoo Breeders. 03 Dec 2012 - New research outlines the sense behind why 'Meeting Mum' is so important when choosing a puppy here. Go to bottom of the page. 30 Nov 2012 - Catch up on recent CCGB group walk reports and photos here. 16 Nov 2012 - More cockapoo blogs have been added here. If you have a blog you would like added please email details to news@cockapooclubgb.co.uk. 14 Nov 2012 - Annettes Labradoodles has been added to the list of Approved Cockapoo Breeders. 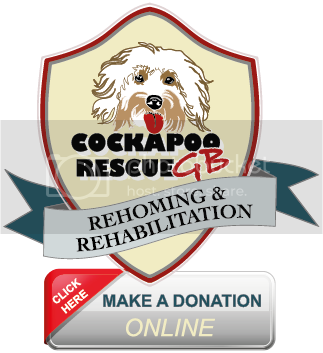 12 Nov 2012 - Check out some of the Success Stories by our Cockapoo Rescue, Rehoming and Respite Care team here. 06 Nov 2012 - Eileen Jackson has been added to the list of Approved Cockapoo Breeders. 28 Oct 2012 - A new walk group has been organised in Hampshire. Look at the first meeting report here. 25 Oct 2012 - Sandra Keevill-Woodford has been added to the list of Approved Cockapoo Breeders. 22 Oct 2012 - Johanna Warden has been added to the list of Approved Cockapoo Breeders. 11 Oct 2012 - Revised Mandatory Health Testing Directive here and here. 10 Oct 2012 - CCGB mentioned in the BVA Animal Welfare Foundation Annual Review here. 29 Sep 2012 - A full report and loads of fantastic photos from The Cockapoo Games 2012 is available here. 27 Sep 2012 - Read about a members experience of Seasonal Canine Illness here. 25 Sep 2012 - The CCGB partners with the newly formed Doodle Agility League. More information and a link to the league is here. 30 Aug 2012 - The CCGB has 'adopted' Woodland Waters in Lincolnshire as it's 'home' for National and other events. Find out more here. 26 Aug 2012 - CCGB August Newsletter link added. To see past issues of The CCGB newsletters 'Poo News click here. 26 Aug 2012 - West Midlands, Clent Hills meeting report here. 21 Aug 2012 - Pankington has been added to the list of Approved Cockapoo Breeders. 14 Aug 2012 - Ali Haynes and Pippa McGuire have been added to the list of Approved Cockapoo Breeders. 31 July 2012 - July CCGB meet reports added in the News & Networking section. 30 Jul 2012 - CCGB ‘poos Triumph at Bark in the Park - report here. 25 Jul 2012 - TICKETS ON SALE NOW. CCGB Members are aiming to raise £2000 for Hounds For Heroes. Win a 4* Dog-friendly 'Lakelovers' holiday! 17 Jul 2012 - Margaret Bridgman has been added to the list of Approved Cockapoo Breeders. 6 Jul 2012 - Preparation is now well underway for the Cockapoo Games 2012 in Lincolnshire during September. If you want to come along on Saturday 15th September to see these wonderful dogs doing agility, obedience, relays and tricks take a look at the Organised Events page for details. 4 Jul 2012 - July, August and September group meets details now available on Groups Walks and Meetings page. 3 Jul 2012 - CCGB Members are aiming to raise £2000 for Hounds For Heroes. Win a 4* Dog-friendly 'Lakelovers' holiday! 3 Jul 2012 - Take a look at our new Group Walk Reports section to see reports and photos from some of our CCGB group walks. 26 Jun 2012 - Sophie Wright has been added to the list of Approved Cockapoo Breeders. 2 Jun 2012 - The latest edition of 'Poo News has been emailed to all members. If you have not received your copy, let us know. All newsletters can also be found on the Cockapoo Newsletters page. 30 May 2012 - Cockapoo Puppy Buying Checklist available to download here. 30 May 2012 - Details for June/July meetings have been added to the Group Walks section. 29 May 2012 - West London Cockapoos has been added to the list of Approved Cockapoo Breeders. 23 May 2012 - With summer approaching, members Colin and Maureen have reviewed products in the review section to help you keep your dog(s) cool when out and about during those hot summer days we are all hoping for. 13 May 2012 - If you are just getting started on your search for a puppy find out what first steps to take to help you decide which breeders to visit Starting your search - First things first. 12 May 2012 - BARF on a budget article added in the feeding section here. 29 Apr 2012 - There are 5 cockapoo group walks organised during May in Surrey, Essex, Northants, Scotland and Lancashire. To see all the details take a look here. 23 Apr 2012 - Cockapoo Registration Criteria has been clarified and the rules posted here. 03 Apr 2012 - April Newsletter issued to all members via email. If you would like to see back issues of CCGB newsletter click here. 02 Apr 2012 - Groups walks have been arranged for April and May. Click here for details and links to the organisers to let them know if you are coming along. 30 Mar 2012 - Our Approved Breeder list goes live. Click here to view. 21 Mar 2012 - Our Stud Dog Scheme is now active, and with the first Approved Stud Member and Approved Breeder Member's on board you can now click here to see the first stud dogs on the list. 6 Mar 2012 - If you want to catch up on back issues of the CCGB monthly newsletter go to Newsletter section of the Members Pages by clicking here. You'll need to be a member to access the members Pages - to join CCGB click here. 5 Mar 2012 - Review added for Aeolus Blaster/Dryer in Member's Reviews section here. 4 Mar 2012 - Report and photos for the Surrey meet on Sunday 4 March added here. 3 Mar 2012 - The Cockapoo Club of GB launches it's newsletter with the first issued emailed to all CCGB members. If you would like to become a member and receive the monthly newsletter join CCGB by clicking here. 2 Mar 2012 - More before and after (puppy to adult) pictures have been added to the gallery. Take a look here. 25 Feb 2012 - Cockapoos Are.... Extracts from Cockapoo Club Chat, a picture dictionary of how Owner Members describe their Cockapoos. 24 Feb 2012 - What are your Cockapoo's basic needs? EMRA explained. 24 Feb 2012 - We love to hear all about you and your dog(s) so please email your story, with a couple of photos if possible, to news@cockapooclubgb.co.uk. 22 Feb 2012 - Need advice and support on aspects of training your cockapoo(s)? If you join CCGB chat you can post questions on our Tips from the Clubhouse thread and we will do our best to help. For a taster take a look at here. To join chat so you can 'ask an expert' click here to join. 18 Feb 2012 - If you want to know all about dad to day life with cockapoos following owners blogs can give you a great insight and lots of information. We now have links to members blogs in the Cockapoo Networking section. If you are a member and have a cockapoo related blog email the URL to news@cockapooclubgb.co.uk and we can add a link to your blog. 15 Feb 2012 - Lots of members stories about their cockapoos have been added to the Members Stories and Information section. Want to become a member? Click here. 25 Jan 2012 - Follow a series of training articles over the coming weeks of Agility Obstace Training Step-by-Step. 22 Jan 2012 - Press Release - The Cockapoo Club of GB Inspector training at Wood Green Animal Shelter. 14 Jan 2012 - The winner of the Christmas Caption Competition is announced - see Cockapoo News to read the winning caption! 10 Jan 2012 - See the results of our Christmas Caption Competition here. 8 Dec 2011 - The Cockapoo Club Chat forum is launched. We look forward to chatting with our members about all things Cockapoo. 18 Dec 2011 - Follow the progress of Freddie the cockapoo's adventures in the world of dog agility by visiting Freddie's Agility Blog from the Networking page. A great blog whether you are new to agility or are more experienced and want ideas to fine tune your agility skills. 17 Dec 2011 - CCGB Inspectors Vacancies, apply now for posts in specific geographic areas via the Application Form. 17 Dec 2011 - Are you struggling to keep your cockapoo's coat clean and dry on wet, muddy walks? Take a look at the latest review of Hurtta Pro Waterproof Overalls by Tracey in the General Equipment review section.